Kenya, officially the Republic of Kenya, is a sovereign state in East Africa. The capital and largest city is Nairobi. Kenya lies on the equator with the Indian Ocean to the south-east, Tanzania to the south, Uganda to the west, South Sudan to the north-west, Ethiopia to the north and Somalia to the north-east. 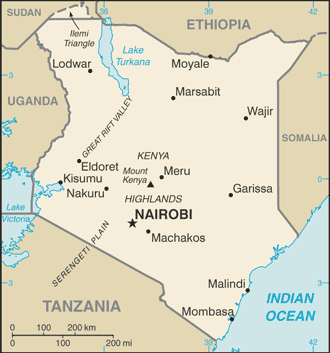 Kenya covers 581,309 km2 (224,445 sq mi) and has a population of about 44 million in July 2012.The country is named after Mount Kenya, the second highest mountain in Africa.